Turn each anxiety, each fear and each concern into a Dua (supplication). Look at it as another reason to submit to God and be in Sajdah (prostration), during which you are closest to Allah. God listens and already knows what is in your heart, but He wants you to ask Him for what you want. The Prophet said: Allah is angry with those who do not ask Him for anything (Tirmidhi). Seek help through Sabr and Salat (Quran 2:45). 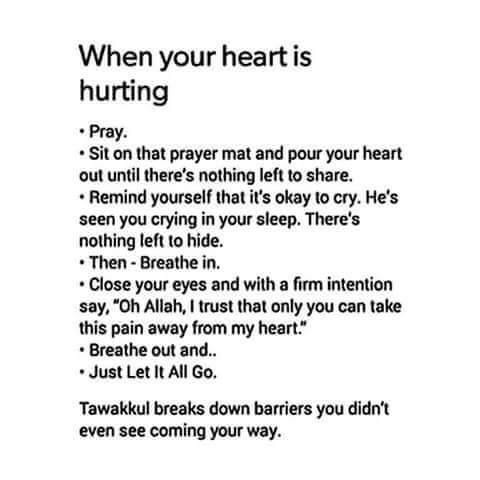 This instruction from Allah provides us with two critical tools that can ease our worries and pain. Patience and prayer are two oft-neglected stressbusters. Sabr is often translated as patience but it is not just that. It includes self-control, perseverance, endurance, and a focussed struggle to achieve one’s goal. Unlike patience, which implies resignation, the concept of Sabr includes a duty to remain steadfast to achieve your goals despite all odds. “God-there is no deity save Him, the Ever-Living, the Self-Subsistent Fount of All being. Neither slumber overtakes Him, nor sleep. His is all that is in the heavens and all that is on earth. Who is there that could intercede with Him, unless it be by His leave? He knows all that lies open before men and all that is hidden from them, whereas they cannot attain to aught of His knowledge save that which He wills them to attain. His eternal power overspreads the heavens and the earth, and their upholding wearies Him not. And He alone is truly exalted, tremendous.” (Quran 2:255). Find a corner of a lake, go out in the wilderness, or even stand on your lawn at your home and call the Adhan with your heart. While driving, instead of listening to the same news over and over again, say Allahu Akbar as loudly as you can or as softly as you want, based on your mood. Year ago, I remember calling Adhan on a Lake Michigan shore in Chicago after sunset as the water gushed against my knees. I was calling it for myself. There was no one else accept the waves after waves of water with their symphony. It was relaxing and meaningful. Allahu Akbar, Allahu Akbar. End your day on a positive note. Make Wudu, then think of your day. Thank Allah for all the good things you accomplished, like Zikr and Salat. Ask yourself what you did today to bring humanity together and what you did to help Muslims become servants of humanity. For everything positive, say Alhamdu lillah (Praise be to Allah). For everything negative say Astaghfirullah wa atoobo ilayk (I seek Allah’s forgiveness and I turn to You [Allah]). Recite the last two chapters of the Quran, thinking and praying as you turn on your right side with your hand below your right cheek, the way the Prophet used to sleep. Then close your day with the name of Allah on your tongue. Insha Allah, you will have a good, restful night. Get up early. Get up thanking God that He has given you another day. Alhamdu lillahil lazi ahyana bada ma amatana, wa ilaihin Nushoor (Praise be to Allah Who gave us life after death and unto Him will be the return). Invest in an audio tape driven alarm clock so you can get up to the melody of the Quran. Or Let Dawud Wharnsby’s joyful notes put you in a good mood. Sing along if you like. Develop your to do list for the day if you didn’t do it the night before. Begin with the name of Allah, with Whose name nothing in the heavens or the earth can hurt you. He is the Highest and the Greatest. (Bismillahillazi la yazurru maa ismihi shaiun fil arze wa la fis samae, wahuwal Alee ul Azeem). The Prophet used to say this after every Fajr and Maghrib prayers. Readingand listening to the Quran will help refresh our hearts and our minds. 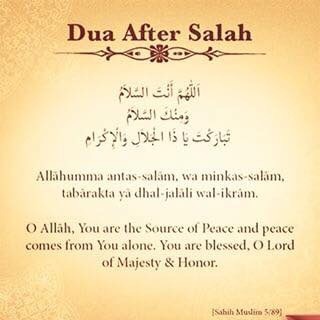 Recite it out loud or in a low voice. Listen to it in the car. When you are praying Nafl or extra prayers, pick it up and use it to recite portions of the Quran you are not as familiar with. Connecting to the Quran means connecting to God. Let it be a means to heal your heart of stress and worries. Invest in different recordings of the Quran and their translations. Our success depends on our sincere efforts to the best of our abilities. It is the mercy of Allah that He does not demand results, Alhamdu lillah. He is happy if He finds us making our best sincere effort. Thank you Allah!